Last weekend, we sold the Pontiac. This car was my first car. My parents bought it from my grandmother when it became clear she could no longer drive herself around town. The deal was mom would drive my grandma and I would drive myself. It was the car we shared when a dead battery caused his parents to decide to sell his car. It was the car we drove up and down California to visit my parents and back again and, finally, to move to LA for grad school. It was the car we drove from LA to Alabama, loaded down with things to precious or necessary for the movers. 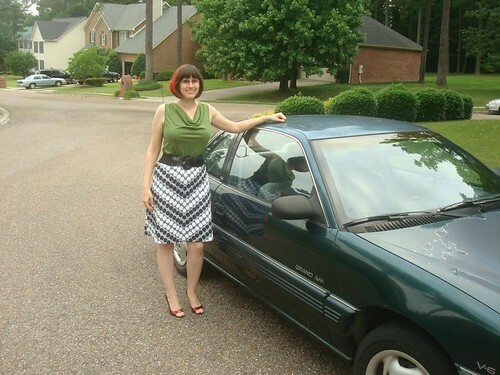 It was the car that we continued to share until we bought my Corolla. Then it became my husband's. At 17 years old, it's been aging out. A blown fuse with no available replacement parts took out the horn and the air bag. The air conditioning has some unidentified leak. The steering wheel literally comes off in your hands in powdery pieces on hot days. The plastic is degrading due to UV exposure and, on hot summer days, smells awful. But the hubby has had a short, 2 mile commute, so it's been manageable. Last Saturday, we sold the car to a coworker of my husband's. He intended to use it for a rally car, but seeing that it was in impressive shape for a 17 year old car, he's decided instead to fix it up himself and give it to a family member. I'm pleased that it will live a bit longer instead of being sent to a scrap yard and I suddenly find myself nostalgic and a bit misty eyed. It was a good car and it's been part of the fabric of my life for so long that it seems strange to see it suddenly gone.